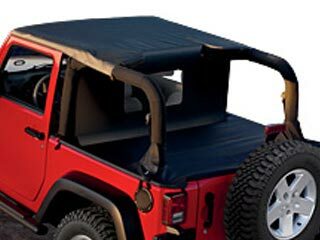 Sun Bonnet, Tonneau Cover and Windscreen Combination is a convenient and economical way to outfit your Jeep for open air cruising and trail exploring. Features 3-Ply premium top fabric, Dark privacy rear window, integrated zippered Windscreen and Tonneau. Available in Black or Khaki. Combo Top only available for 2 Door Wrangler. Order 82209936 adaptor kit for Jeeps originally built with a hardtop (See Accessories tab above).